Indore is termed as the modern, dynamic, commercial capital of Madhya Pradesh. Its blooming economy has made this city the state’s very own “Future city”. However, in this race towards the future we often leave behind our glorious past. And Indore has a very interesting history. 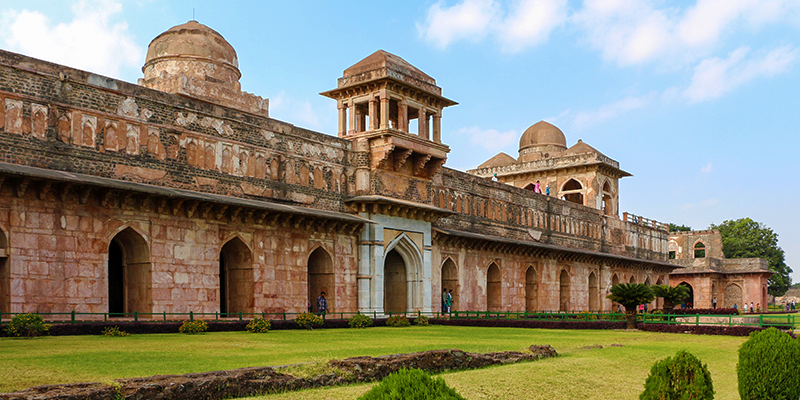 Let us have a look at some of the glamorous forts in and around Indore displaying glories of Indian history. After the death of Malharrao Holkar, he was succeeded by his daughter-in-law Ahilya Bai Holkar. Ahilyabai moved the capital from Indore to Maheshwar (4,000 year old town, 90 KM from Indore) situated on the banks of river Narmada. 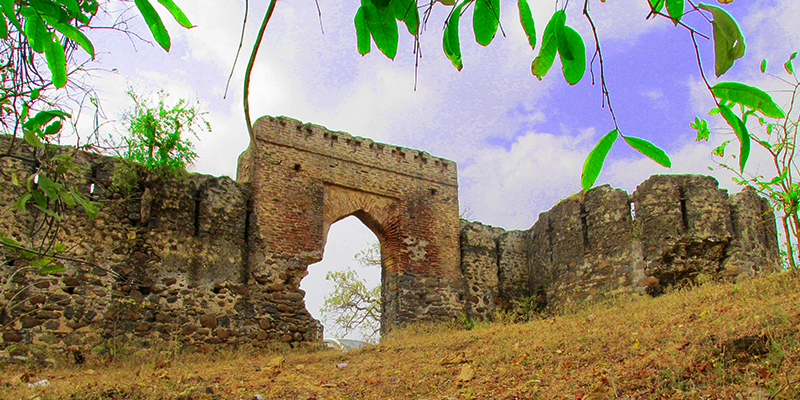 The Maheswar fort was built in the late eighteenth century and remained the capital of Holkars until 1818. The fort was constructed in royal Rajasthani pattern with oriental windows and arches, and stands on a hill overlooking the Narmada river. 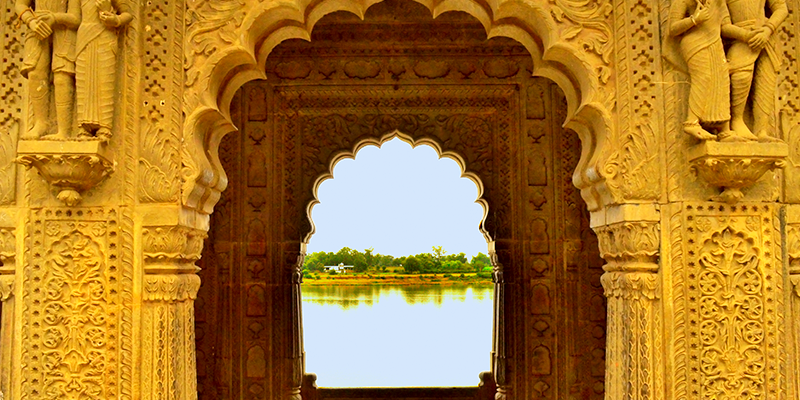 As one approaches the ghats flanking the river, you are welcomed by a massive arched gateway. The gateway then leads to an open courtyard that houses memorials of Ahilyabai and the rulers of the state called as “chattris”. At the centre is the chattri of Vitoji Rao, who led an unsuccessful battle against the Peshwa’s. The chattri of Ahilyabai is called as Ahilyaleshwar Shivalaya as it also hosts a Shivlingam in the grabhagriha (inner sanctum). Rest of the fort was converted into a hotel in 1971 by Prince Richard Holkar. 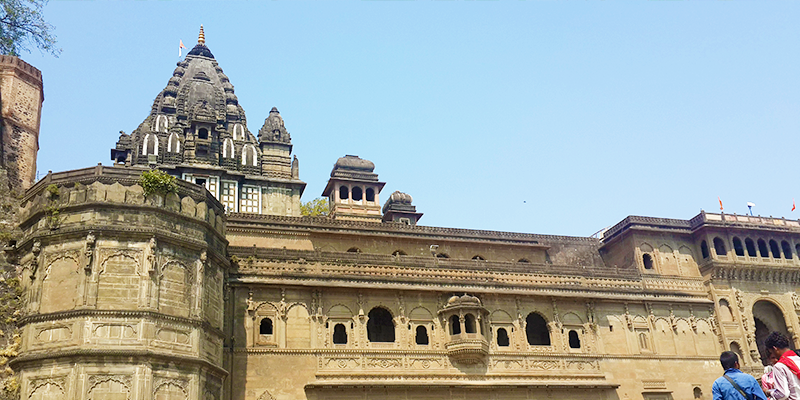 Must Do: A boat ride from Ahilya Fort to Baneshwar Temple, situated on a tiny island is strongly recommended. Must Visit: Nearby Baneshwar temple, lies on the axis connecting the centre of the Earth to the pole star. Shopping: Maheswar is famous for its cotton sarees, which have been made here from fifth century onwards. When Malharrao Holkar laid the foundation of Holkar state he created the magnificent seven-storied Rajwada Palace as his seat. Built over two centuries ago Rajwada today stands as a prime example of royal splendour and magnificent architecture. The front gate is a giant wooden door covered with iron studs. One can see the combination of Maratha, Mughal and French architecture in the palace. First three floors are built in stone while the rest are made up of wood. The carvings showcase the rich heritage of Maratha architecture. On the first floor is the Maratha Durbar Hall built in traditional French architecture. Behind this is Holkar’s residential palace which was completely destroyed in a fire in 1984. Post renovation it is now converted into a small museum filled with artifacts and personal belongings of the rulers. Rest of the rooms in Rajwada has been converted into various offices of ASI (Archeological Survey of India). Entry Fees: Rs. 10 per person for Indian citizens and Rs. 250 for foreign nationals. For taking cameras along one has to pay Rs. 25 extra. 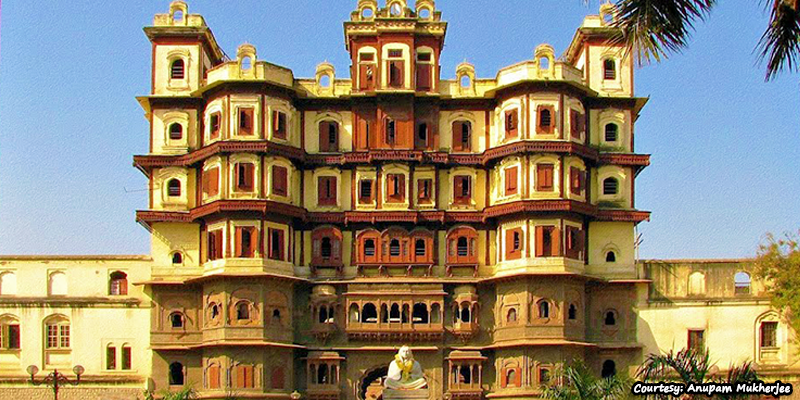 Must Do: Surrounding areas of Rajwada Palace are famous for street shopping as well as home to famous chat shops. Must Visit: 500m from the palace lies the Krishnapura Chatri (cenotaph). Krishnapura Chatri houses the chatri’s of Maharani Krishnabai, Maharaja Tukojirao and Maharaja Shivajirao. RailYatri Tips: As the Khajuri Bazar (Old City) area where this palace is situated remains heavily crowded, it is recommended to use public transport or walk to the monument. Dhar, 60 KM from Indore, was once the capital of Raja Bhoj. In 1685, Mohammed bin Tuqhluq captured Dhar and built this fort. The fort was built on a mountain overlooking the city. Its interiors consist of deep rock-cut cisterns and a part of Raja Bhoj’s palace. It also houses a museum containing small collection of artifacts. One part of the fort is called “Kamal Maula” which is a specious enclosure containing four tombs of Islamic saints – Shaykh Kamal Maulavi and Nizamuddin Auliya. Lath Masjid or Pillar Mosque behind Kamal Maula is made of iron pillars. The masjid was constructed in late 11th century. “Bhoj Shala”, built in 1903, which is situated right besides Kamal Maula is an attraction here. Bhoj Shala (School of Raja Bhoja) has inscriptions for a number of poems written by Raja Bhoj himself and Raja Arjunavarnam, who ruled over a large part of Malwa in early 13th Century AD. Must Do: Taste some of Usal Poha (a dish made of soaked beans poured on the top of Poha) at the local eateries near the fort. Must Visit: Jeera Bagh Palace, which was the residence of Pawar Dynasty, is situated a short distance from the Dhar Fort. It is an example of early modern architecture in India. It is a rare fort in Madhya Pradesh that can be seen on Google Maps. Situated 20 KM from Indore this, now ruined, fort has a lot to say about its past. Built sometime in late 18th century, the fort got its named from ancient Kajligarh Mahadev Mandir located inside the fort though not much history is known about this. You will have to trek some distance to reach the fort, since it is built on a hill, and the stairs are in depleted condition. This is one of the cool hangout places for youngsters. The area surrounding the fort becomes beautiful during the monsoon season when a green cover is added and a small waterfall comes to life. It is a must go if you like old forts and have an appetite for valley covered hilltop areas. Must Do: Sunrise views from the top of this fort are a must watch. Must Visit: Famous Tincha waterfalls, lies at 6 KM from the fort, which is Indore’s famous weekend getaway. RailYatri Tip: Do not stay back at this place after sunset for security reasons. Previous articleDiwali nostalgia: Munching our traditional snacks can never go old! Excellent work Dear Anshul. It is an wonderful attempt to explore the knowledge you gained and I have seen the sincearity with painful hard work to collect the truth behind the data you fed. I deeply appreciate the perfomamce and congratulate you wholeheartedly and extend fullest support when and where you felt. My sincere Thanks to ‘Railyatri’ for providing an ample apportunity to open out and publish this article which will provoke My Son to move forward on this field and go on attending recognitions in future.. Excellent article dear Anshul. ..congratulations. its really very informative and giving information regarding our glorious history. I like it very much. Keep it up dear.